In a region that already boasts some of the states most scenic paths, Sleeping Bear Heritage Trail is destined to be the crowning jewel when its finished. The proposed 27-mile trail through the park was will extend from Good Harbor Trail (County Road 651) on the northern boundary of the park southwest past Empire to Manning Road, running parallel to M-22 and M-109 for much of the way. Most of the non-motorized trail is an asphalt-paved, 10-foot-wide path accessed by 11 trailheads and lined with amenities ranging from restrooms and picnic areas to benches along the steepest slopes. In a region that already boasts some of the state’s most scenic paths, Sleeping Bear Heritage Trail is destined to be the crowning jewel when it’s finished. 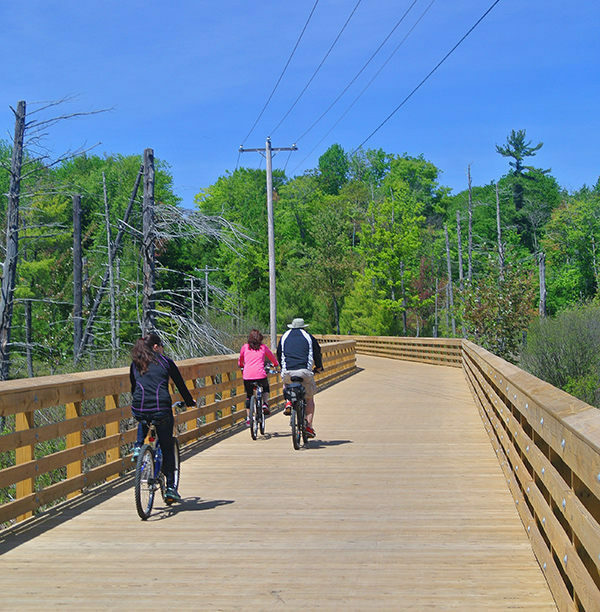 The seed for the paved trail was planted in 2005 when the Leelanau Scenic Heritage Route Committee pitched the idea to the National Park Service. It was noted that while Sleeping Bear Dunes National Lakeshore had more than 100 miles of hiking trails and even 9 miles of equestrian trails, none were paved and suitable for recreational use by cyclists, wheelchair users, runners pushing baby strollers and rollerbladers. After years of reports, studies and environmental assessments, a 27-mile trail through the park was on the drawing board, extending from Good Harbor Trail (County Road 651) on the northern boundary of the park southwest past Empire to Manning Road, running parallel to M-22 and M-109 for much of the way. Most of the non-motorized trail is an asphalt-paved, 10-foot-wide path accessed by 11 trailheads and lined with amenities ranging from restrooms and picnic areas to benches along the steepest slopes. The exception is a 3.1-mile segment through the Port Oneida Rural Historic District where the trail surface is compacted crushed limestone. 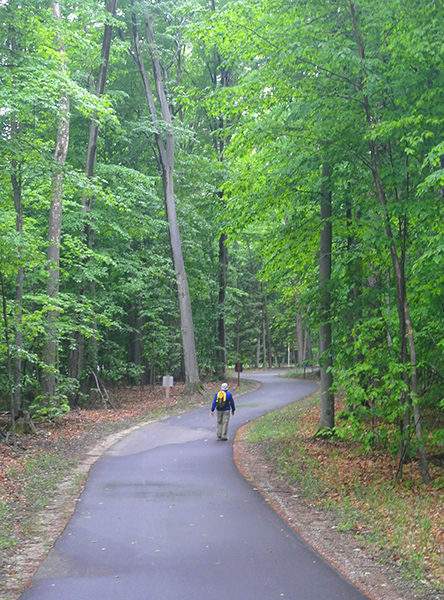 The first section, opened in 2012, is a 4.3-mile segment from the Dune Climb to Glen Arbor. This is by far the most popular stretch of the Heritage Trail. In 2014, the 6.8-mile segment from the Dune Climb to Empire was added and a year later the trail was extended 6.5 miles north to the historic farming district of Port Oneida. In 2016, another 3.6-mile segment pushed the trail east to Good Harbor Bay. Mileposts along the Heritage Trail begin with Mile 0.0 at the Dune Climb with mile markers to the south starting with "S" (S01.0) and those heading north towards Glen Arbor starting with "N" (N01.0). But Glen Arbor serves as the hub of the system and the first segment had no more been paved than bike rental shops and other services appeared in town. 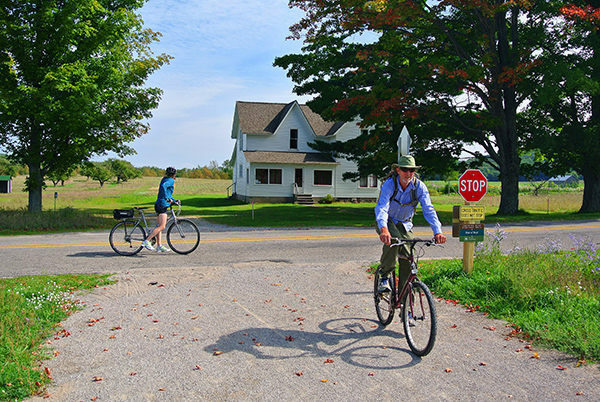 In 2014, the Bay Area Transportation Authority (BATA) set up a Bike-N-Ride bus service for the Heritage Trail similar to what is offered for the Leelanau Trail. For that reason and because of the popularity of the ride from Glen Arbor to the Dune Climb, the Heritage Trail is described here as an 11.1-mile ride from the Alligator Hill Trailhead to Empire and an 11.7-mile ride from the Alligator Hill Trailhead to Good Harbor Bay at the north end of County Road 669. In winter, the Friends of Sleeping Bear Dunes grooms segments of the trail for both classic Nordic skiers and skaters as well as providing a lane for snowshoers. The ride from Glen Arbor to Empire is an 11.1-mile outing, with the first section to the Dune Climb by far the busiest stretch of the Heritage Trail. For a detailed map of this section click here. In Glen Arbor, the trail shares the trailhead with the Alligator Hill Trail on Forest Haven Drive, 300 yards west of M-22. There are no facilities except parking. Head north on Forest Haven Drive to pick up the well-posted Heritage Trail within a third of a mile and then west on the paved path into a forest that was devastated by the August 2015 storm. Though the trail skirts Alligator Hill at this point, it remains a level ride in the summer and an easy ski in the winter. The Heritage Trail crosses M-109, a busy state highway in the summer, at Mile 1.9 and then skirts D.H. Campground, where there is access to toilets, drinking water, a beautiful beach and a picnic area. At Mile 2.2, the trail enters historic Glen Haven and crosses M-209. Founded in 1857 when a sawmill was built, Glen Haven was developed as a deep-water port to service shipping traffic with firewood, lumber and other supplies. The most distinctive building seen from the trail is the bright red Glen Haven Canning Company structure. Originally built as a warehouse, it was converted to what was then a state-of-the-art cannery for cherries in the early 1920s. Today it is a seasonal maritime museum filled with historic boats that once plied the waters between Glen Haven and the Manitou Islands. Nearby is a fully restored blacksmith shop and the Glen Haven General Store. All three museums are open daily from Memorial Day weekend through Labor Day. After crossing M-209, the trail enters a semi-open meadow and begins a long, gentle climb, topping out at the west end of Dunes Valley Road at Mile 3 where it swings south and re-enters the woods. A gentle descent leads past the D. H. Day Group Campground, where toilets and drinking water are available. You then pass some of the trail’s most impressive terrain. On one side of the trail is a lush green forest, on the other a towering dune so steep that occasionally small avalanches of snow rumble down it. The Heritage Trail merges into the park’s Duneside Accessible Trail, a half-mile path featuring a series of interpretive displays and benches, before arriving at the Dune Climb at Mile 4.3. The Heritage Trail departs the Dune Climb to the south and within a mile changes from flat to hilly. The first steep hill is encountered at Mile 5.8 where there is a bench at the top. You descend to Greenan Road, follow it briefly to the west (right) and then continue south by climbing the longest hill of the ride, one that gains almost 100 feet in a quarter mile. Nicknamed “the Bear,” it is lined with benches. You reach a spur to the Pierce Stocking Trailhead at Mile 6.9. After crossing Pierce Stocking Drive, the Heritage Trail climbs again, followed by a long and pleasant downhill run. For the next 1.6 miles, cyclists enjoy a free ride that includes speeding past the M-22 and M-109 intersection. At Mile 9, the trail swings west and climbs one more hill before arriving at the intersection of Voice Road and Bar Lake Road, reaching the Bar Lake Road Trailhead at Mile 9.5. North Bar Lake, a popular day-use area and beach, is 1.4 miles to the north via Bar Lake Road. The Heritage Trail swings south at LaCore Road and ends. You follow LaCore Road south to Empire, reaching the Philip Hart Visitor Center at Mile 11.1. For those using the BATA Bike-N-Ride service, the bus stops in Empire at the gas station on the corner of M-22 and M-72. East of Glen Arbor, the Heritage Trail follows roads through town and for 3.4 miles to the Crystal River Trailhead. From the Alligator Hill Trailhead, head north on Forest Haven Drive and then east (right) on M-109 and M-22 through the heart of downtown Glen Arbor. Keep a watchful eye on traffic! There is a dedicated bike lane along M-22 but in the summer, especially on weekends, this five-block stretch often bustles with cars, pedestrians and cyclists. Turn south (right) on Oak Street to escape the maddening summer scene and then west (right) for a block on State Street. Turn south (left) on Lake Street and within a third of a mile go east (left) on Northwoods Drive, a pleasant road to pedal because of its leafy canopy and light traffic. The north shore of Glen Lake is just to the south but usually hidden by homes and foliage. At Mile 3, turn north (left) on Fisher Road and in less than a half mile you cross over beautiful Crystal River and arrive at the Crystal River Trailhead. From the trailhead the Heritage Trail briefly skirts County Road 675 as a dedicated paved path before crossing it and heading north into the wetlands west of Tucker Lake. An impressive 800-foot boardwalk provides passage and makes for an ideal place to pause and look for wildlife. At Mile 4.3, the Heritage Tail crosses M-22 near the Homestead Resort. Another hilly stretch is encountered after crossing M-22. You immediately climb a hill and then descend to Thoreson Road, where post No. 9 of Bay View Trail is located. You climb again and then enjoy a long downhill run. At Mile 5.5 is post No. 6, where the surface changes from asphalt to compacted crushed limestone as the Heritage Trail enters the Port Oneida Rural Historic District. At Mile 6, the Heritage Trail crosses Thoreson Road, which leads west to the Bay View Trailhead, and in another half mile arrives at the Charles Olsen Farm with its impressive red barn and steel and wooden silo. The classic farmhouse and barn were built in 1918 and have since been restored by the National Park Service. Continuing in a northeast direction, the Heritage Trail passes post No. 3, marking a spur of the Bay View Trail that leads a half mile up a ridge to Lookout Point. Just beyond it you arrive at Port Onieda Road at Mile 7.1. On the west side of the road is the Port Oneida Schoolhouse built in the 1890s and a classic outhouse. On the east side is the Kelderhouse farm built around 1910. The Heritage Trail swings around the Kelderhouse Cemetery to M-22 and then begins to skirt the state highway, remaining within view of it most of the time. Near the intersection with Wheeler Road at Mile 8 you arrive at the Lawr Farm that dates to 1890. Just beyond the farm the trail crosses Basch Road and passes through a small roadside rest area with two picnic tables. Within a quarter mile, the trail swings away from M-22 and enters the woods, arriving at the west side of Narada Lake at Mile 8.7. Tucked into the trees nearby is the North Unity School, a one-room log structure that was built in 1860. At this point the Heritage Trail skirts the lake by dipping down to cross its marshy south end via a 1,000-foot boardwalk. On the other side you climb to the Goffer farmhouse overlooking Narada Lake on M-22 at Mile 9. At this point the Heritage Trail resumes being an asphalt-paved path. The trail remains close to M-22 for the next mile, passing views of Bass Lake on the south side of M-22 and then Bass Lake Cottages. A quarter mile beyond the resort Heritage Trail ends at County Road 669 (Bohemian Road), reached at Mile 10.7. Plans call for extending the trail another 5.2 miles past Little Traverse Lake to the north end of County Road 651 (Good Harbor Trail). The day-use beach area, with restrooms, a picnic area and parking, would serve as the eastern trailhead for the Heritage Trail. Alternatively, Bohemian Road ends in a mile to the north at another day-use area on Good Harbor Bay, with toilets, drinking water, picnic tables and a beautiful beach. The facilities at the trailheads vary, with most featuring a toilet, information kiosk and parking. Those with drinking water include Glen Haven, Sleeping Bear Heritage (Dune Climb) and the Philip A. Hart Visitor Center. A Sleeping Bear Dunes National Lakeshore annual or weekly vehicle pass is required to use most of the trail. Visitors need to show a pass at the contact stations at the Dune Climb and Pierce Stocking Scenic Drive, or place it on their vehicle dashboard if departing from a NPS trailhead or along a road. For those few sections of the Heritage Trail that lie entirely within road rights-of-way, no entrance fee is necessary. Passes can be purchased from the Philip Hart Visitor Center, at contact stations or self-registration stations at the trailheads. Just south of Glen Arbor, the Heritage Trail is picked up at the Alligator Hill Trailhead, reached by turning west on Forest Haven Drive off of M-22 a half-mile south of town. The trailhead also provides parking for the Alligator Hill Trail. Other trailheads to the east include Crystal River near the intersection of County Road 675 and Fisher Road, Bay View on Thoreson Road just north of M-22 and Port Oneida on Port Oneida Road just north of M-22. 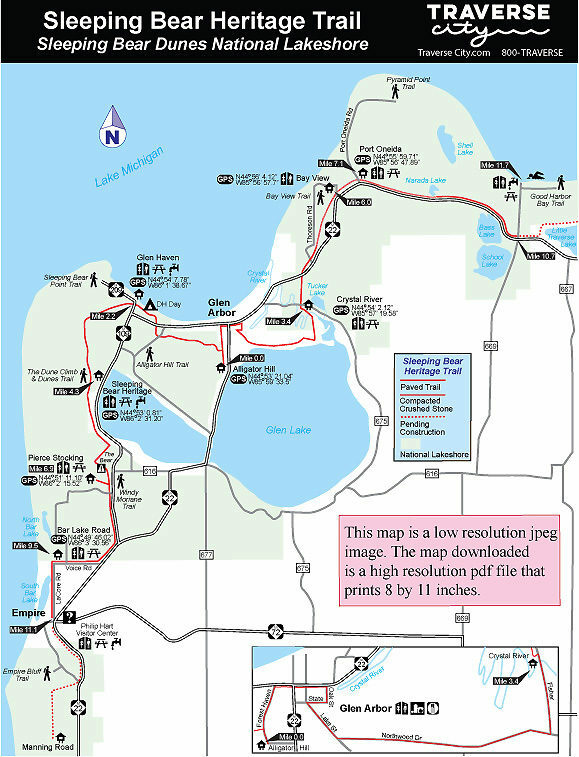 Trailheads between Glen Arbor and Empire include Glen Haven on M-209 (Glen Haven Road) just north of M-109, Sleeping Bear Heritage at the Dune Climb day-use area on M-109, Pierce Stocking at the start of Pierce Stocking Drive off M-109, Bar Lake Road 0.7 mile west of M-22 via Voice Road, and the Sleeping Bear Dunes National Lakeshore Visitor Center near the corner of M-22 and M-72 in Empire. From late May to late October, BATA offers Bike-N-Ride service on Route 11 that extends from Traverse City to Empire with stops in Glen Arbor. The specially-equipped buses can carry 11 bikes, including child trailers, and depart daily from the Hall Street Transfer Station in Traverse City from late June through Labor Day weekend and on weekends the rest of the season. 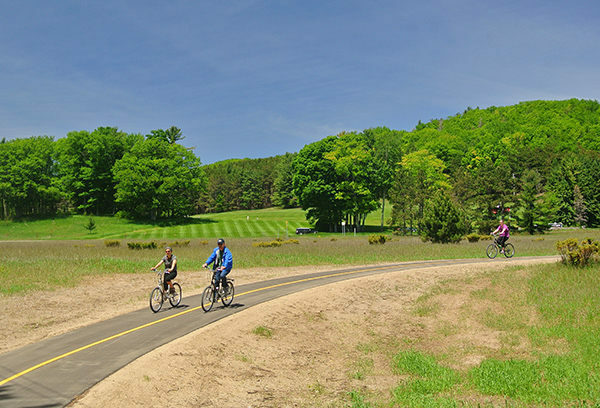 Stops along the Heritage Trail include the Homestead Resort, Glen Arbor, the Dune Climb, Pierce Stocking Drive, and Empire, so it’s possible to ride a portion or most of the trail. In Glen Arbor, the stop is at the corner of M-22 and Oak Street. Bikes are transported as part of a regular $3 fare that is paid on the bus in cash or with a BATA FlashFare card. It’s first-come-first-serve, so in July and August it’s wise to get to the stops early. For a complete list of stops and times, contact BATA (231-941-2324; bata.net/bikenride). For more information, go to the Sleeping Bear Heritage Trail website or the Friends of Sleeping Bear Dunes website. For more information about the national lakeshore, contact or stop at the Philip Hart Visitors Center (231-326-5134; www.nps.gov/slbe). Located near the corner of M-72 and M-22, the center is open daily from 8 a.m. to 6 p.m. from Memorial Day to Labor Day and 8:30 a.m. to 4 p.m. the rest of the year.